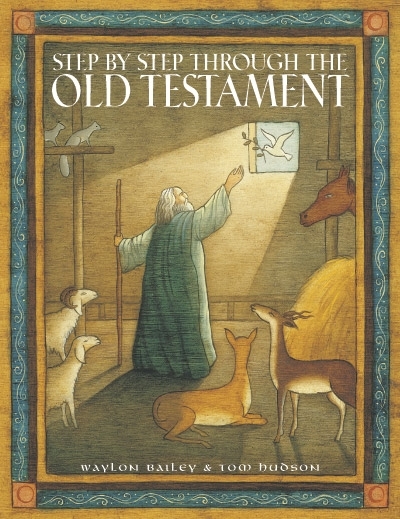 I’ve begun to go through Step By Step Through the Old Testament, by Waylon Bailey and Tom Hudson. I got it from the Lifeway store, but you can also get it from Amazon.com. I picked it up, because I wanted to learn more about the Bible, and learn things in great depth. I didn’t choose a Beth Moore study, because videos are involved and the lessons are extremely time consuming (hours of homework each week). My church does Beth Moore classes, but the times conflict with my handbell practices. I’ve done four lessons so far in the Old Testament book, and I’m very impressed. I’ve learned things that I never knew before. In fact, considering that I grew up in churches, I wonder why no one ever taught me these things! The book starts out with a geography lesson about Palestine, including landforms and the cultural groups that lived there. Then, you learn about the 5 divisions of the Old Testament. I had no idea they were divided into books of law, history, wisdom, major prophets, and minor prophets. Anyways, if anyone wants to do this study with me, get the book, do the lessons, and let’s get the comments going! !